Nearly all my work (combines) contain landscape images, places, environments that are realistic. The works also have sculptural and abstract components. The abstract feature of the Baptism series is the shape of the bow of a boat, my symbol for baptism. The figure is an “every person.” Each of us can experience initiatory rites that bring insight or awareness of the beauty and wonder of life. The landscape part of the painting represents a place on our spiritual journey. 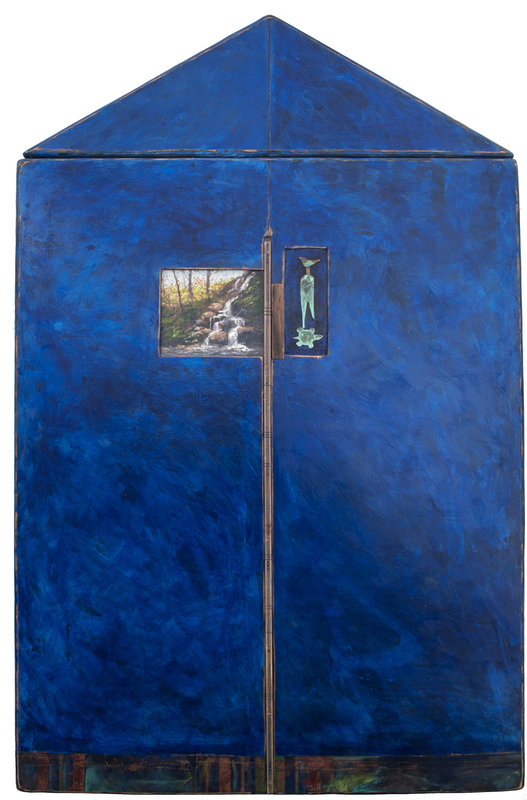 Each work is created from mixed media, primarily acrylic on wood panels. Sculptural elements are natural materials such as bone, wood, ivory, metal and found objects. All the materials are worked together in attempt to create a whole and a sense of ongoing ritual. 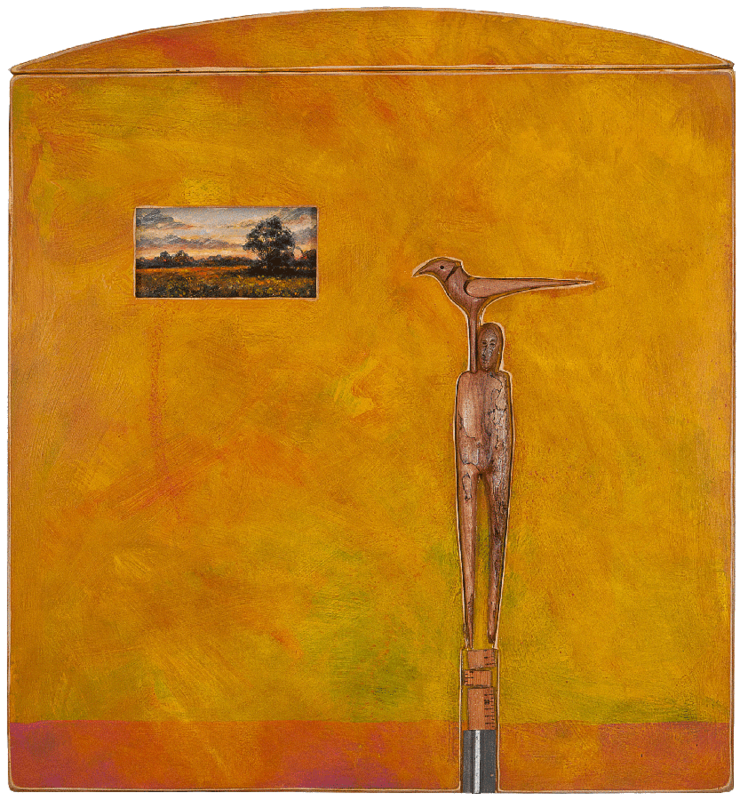 Defining elements in the Becoming Human paintings are: sculptural, a human figure between a bird and a tortoise or turtle. The bird represents our free will and higher thought. The turtle represents our reptilian brain. The figure, itself usually incomplete, is a way of seeing ourselves in the tension between the two. The painted components are both abstract and realistic. They work together with the sculptural to become a whole. 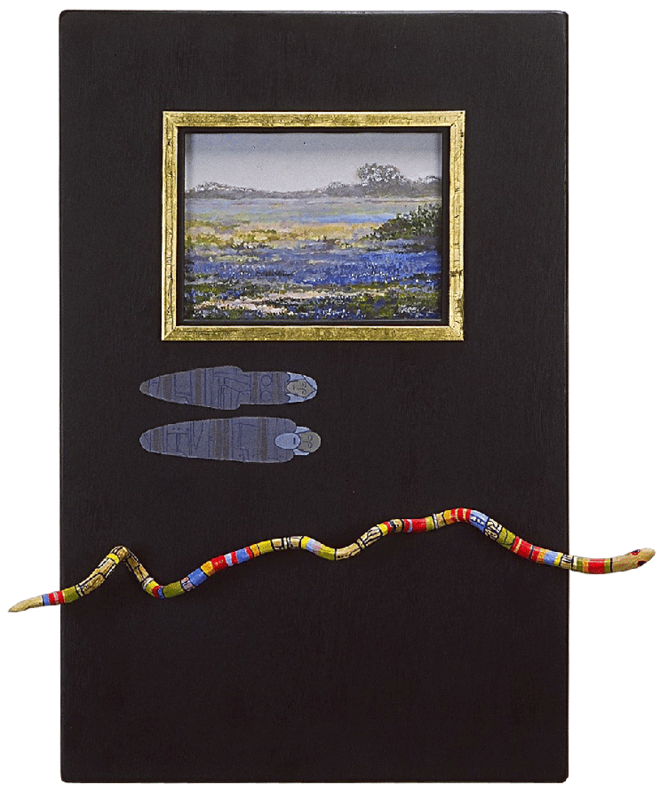 A band across the painting indicates our presence on the pathway of life or journey of the spirit. 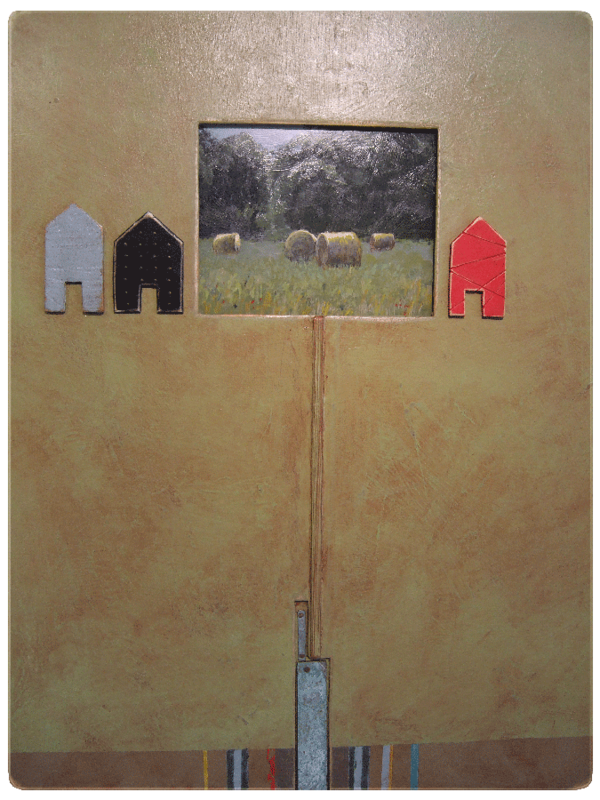 Each of the combines is mixed media, primarily acrylic on wood panel. Sculptural components are made of wood, bone, ivory, metal and found objects. They all work together to become an aid to understanding the process of becoming more human. Each work or combine in the Bound Figure body of work contains a sculpted figure that has been wrapped or bound. It is a metaphor for all the things that we have been fated to or have chosen. They define place, time, gender, and our spiritual path. “Bound,” in this sense, is the product of education, experience, family, community, and culture. That binding to our environment and to all the things that make us who we are, is represented by the bound figure. Consistently present are three components: a representational, an abstract, and a sculptural element. They create a dialogue between destiny (the things we are bound to) and determinism (the expression of our freedom of choice). 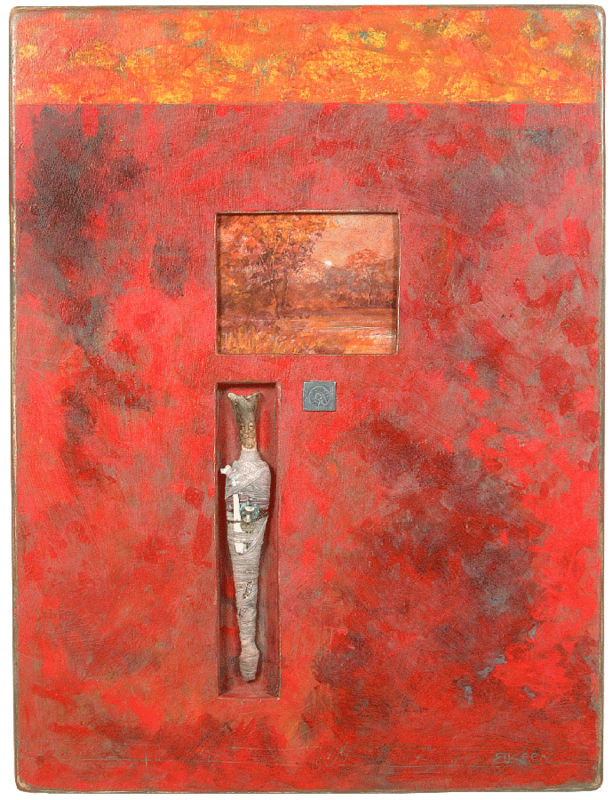 Each work is mixed media, primarily acrylic on wood panels, carved natural materials and found objects. 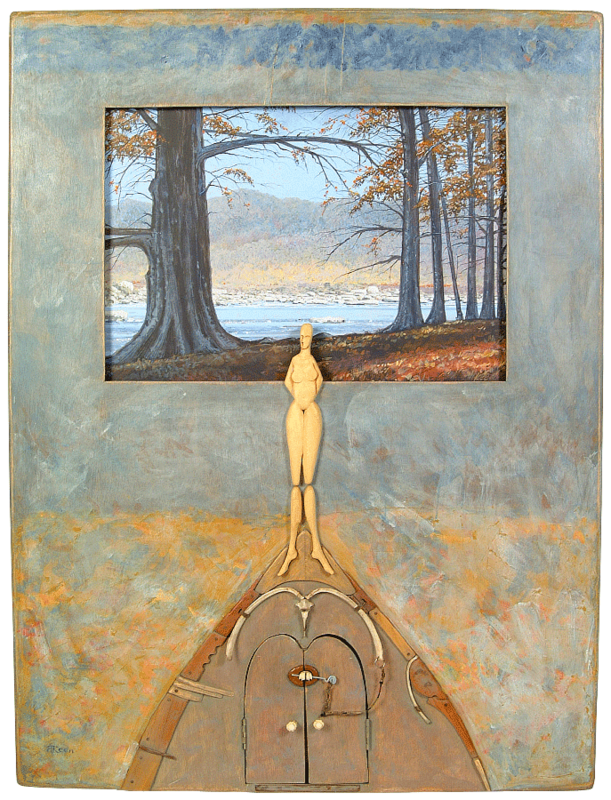 A familiar theme in my paintings is the dialogue between fate (destiny) and free will (determinism). Our lives determine and are determined by our culture, education, experience, family, gender, community and society. The idea of free will is seductive. All of us like to believe we are free. Determinism is chief among the ideas we use to define ourselves. In a large part of our lives we have no free choice because those parts have been fated to us. The freedom we imagine for ourselves is that we are self-reliant, immune to the influence of history or our surroundings. In my visual vocabulary, birds have free will. They can come and go as they please. Reptiles represent those parts of our life we are unable to control, just as snakes and turtles are bound to place. Also present in each work are abstract and realistic components. These few comments provide context for the Guadalupe River Meditation combines. A river is a metaphor for the cycle of life. The waters of the Guadalupe, from its living springs in Texas Hill Country limestone down to its entry into the delta of San Antonio Bay, are on a journey. It is always the Guadalupe. From the spring waters of our youth until the still waters of our ending, we follow a path much like a river. The river has water, flora and fauna appropriate to each season and location along its course. A Guadalupe bass cannot live in the delta; and a redfish cannot live in the Hill Country streams of the South Fork. The cypress and salt grass both belong to the river, but have no choice as to place. Birds have free agency tied to the journey of the river, just as our free will is bound to our place and time. 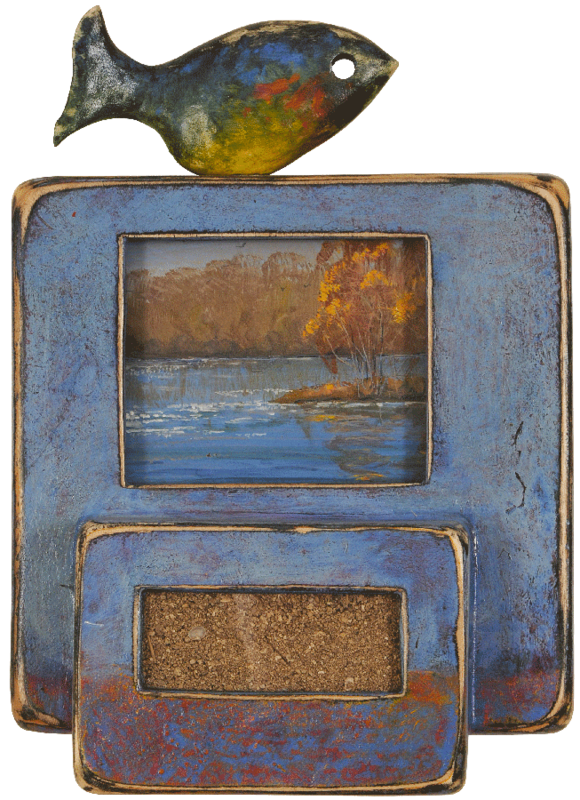 Detritus contained in windowed vitrines is used to document date and place, just as the art documents my experience of the river and life. 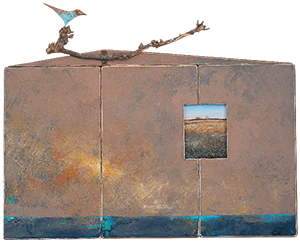 My art has been profoundly shaped by my youth in North Texas and wandering in the Great Southwest. Admittedly, the work manifests conflicting tendencies toward representation and abstraction, public and private meaning. This body of work engages both the external world and its surrogates, the images themselves. 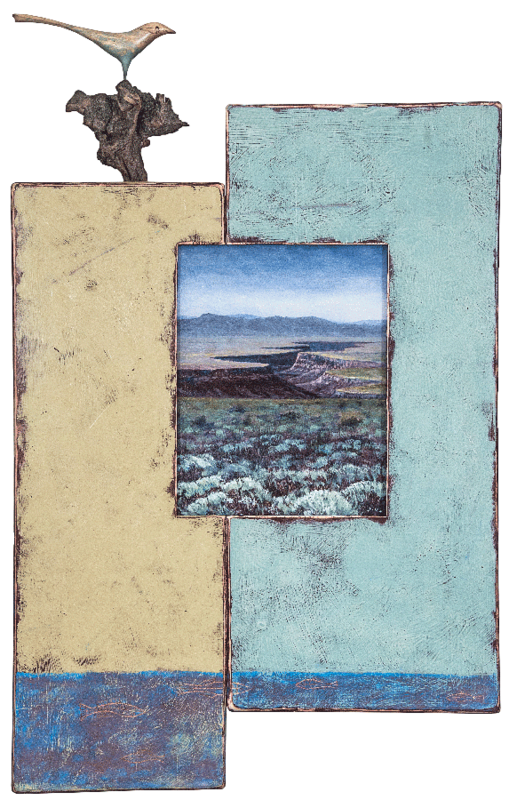 It explores territory seen in the rearview mirror: How do we deal with the western landscape? How do we deal with change? Does the art try to preserve an idealized past? I hope not. A horizontal glyph across the bottom of each work is a mark for our spiritual journey. Birds, because of their ability to fly anywhere, represent free agency and our free will. Reptilian and bound human figures are my visual vocabulary for the things we are “fated to,” just as snakes and turtles are irreversibly connected to place. Incomplete figures illustrate our striving to become fully human, emotionally and spiritually. Detritus used in each combine serves to document the date and the place, just as the art documents my experience on the journey. These works contain iconic landscape images that mark places and times of resurrection. 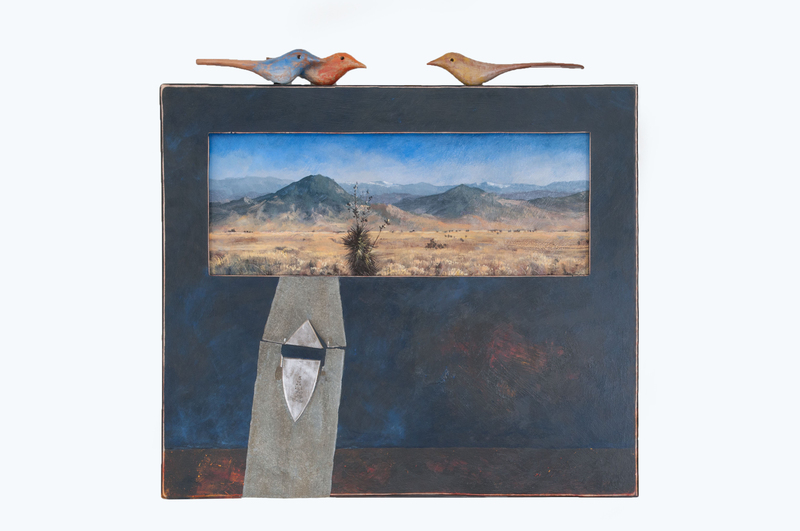 As representational landscapes, each affect the maker’s and the viewer’s relationship to the sculptural component, a winged figure, and the abstract element. A winged resurrection figure is made from materials such as bone, wood, ivory, metal and found objects. 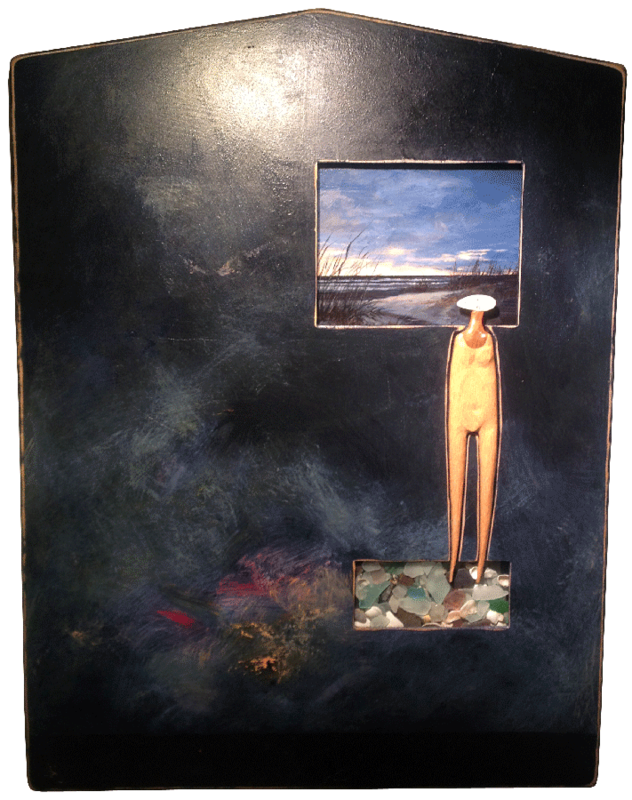 Each painting is created from mixed media, primarily acrylic, on wood panels. It is the artist’s hope that these combines will have a resurrecting effect on the viewer.